There are a couple of my colleagues who are using HTML Help Builder, they are all on one server but different sessions. And sometimes they get read-only warnings for some of ww.classes. They don't get the errors if they run the application As Admin. Is that how they should run it or are we missing anything in installation at the first place? Like, do we need other licenses and registration numbers? We used the same registration number for them. They also say some times they see a message at the bottom of the help builder window saying something like: "this file has been created by the Shared version" (apparently a couple of files were created before they use the registration code). Could that be the reason of getting errors and how they should fix it? I think the errors not happening as Admin are conincidental. File Locking can occur during startup as HB tries to cleanup the file when it starts by packing and reindexing. If the file is in use like that while another user come on and the file is large this can time out. 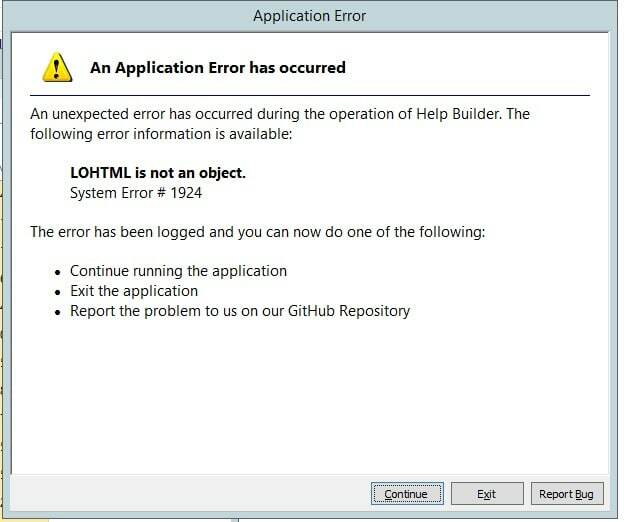 Help Builder mostly works in multi-user mode, but it was never really designed for multi-user usage and any issues you see you unfortunately have to live with. The loHtml is not an object is a bug I've been trying to track down. It's related to the previewer, but reasons unknown it bypasses the built-in exception handlers and still pops to the top. There are a few mitigations in the latest release but I still see it from time to time popping up. It's on my list to get that fixed but haven't found a solution. I'll let them know and I think they should be fine.